OSWEGO, NY – Campaign coordinator Rob Rolfe and the campaign team from Pathfinder Bank were honored at the United Way of Greater Oswego County’s annual Salute to Volunteers held March 9 at The American Foundry. The Pathfinder Bank campaign team was recognized for its role in coordinating its employee campaign in support of United Way of Greater Oswego County. 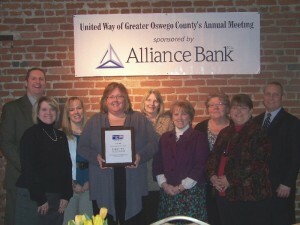 The United Way of Greater Oswego County presented Pathfinder Bank with the Company Campaign Award. From left are: Rob Rolfe, Terri Richardson, Rebecca Knox, Laurie Pryor, Cindy Claflin, Roberta Davis, Marsha Dorval, Cathy Duncan, and Thomas Schneider, president and CEO of Pathfinder Bank. Presented annually, the Company Campaign Team of the Year Award is given to the team whose dedication, enthusiasm, and creativity go well above and beyond what is expected. The campaign team from Novelis Oswego Works was honored to present Rolfe and the Pathfinder Bank team with the award. “We were proud to be able to present the United Way’s Company Team of the Year Award to Pathfinder Bank. We salute Pathfinder Bank and thank them for seeing the needs of our community and supporting the Live United spirit. The Pathfinder Bank team has shown the same attributes as Oswego Works with its extraordinary commitment, energy, and enthusiasm in meeting their United Way goals. Our collective efforts have added to the strength of the United Way of Greater Oswego County’s annual campaign and I am sure that both Oswego Works and Pathfinder Bank will be at the top of United Way’s list of strong participants in the coming years,” said human resource coordinator for Novelis Oswego Works, Carol Dillabough. Executive Director of the United Way of Greater Oswego County, Melanie Trexler, echoed those thoughts and praised the efforts of the Pathfinder Bank team. “Rob and the Pathfinder Bank team did a wonderful job with their employee campaign. Thanks to their efforts they achieved a 6 % increase in their campaign and combined with a corporate match, Pathfinder Bank’s total contribution to United Way was in excess of $14,000. In addition to their annual employee campaign, Pathfinder Bank supports United Way year round as their employees donate their time and talents to serve on our board of directors and assist us with events throughout the year, such as our Stuff-A-Bus campaign and much more. Their enthusiasm and dedication to the success of their employee campaign plays an important role in the way they embrace the Live United concept of the United Way. 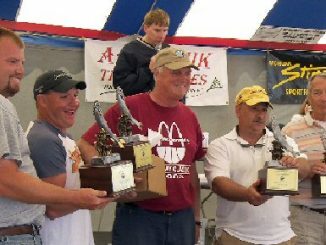 The collective efforts of Pathfinder Bank, Rob Rolfe, and the entire employee campaign team are truly commendable,” she said.